Rice pudding is one of my dad’s favorite desserts. Way back when, my dad took me around for college visits (I told you it was way back when). When we arrived in Cambridge, we took a walk through Harvard Square. I remember it started raining, so we ducked into the closest doorway. We found ourselves in Mr. Bartley’s Burger Cottage. Little did I know that we’d stumbled upon a local institution. My dad was hungry, so he ordered an appetizer: a bowl of rice pudding. Then, we feasted on hamburgers and fries. My dad ordered rice pudding again for dessert. I like rice pudding too. I think of it as a delicious way to use up leftover rice. 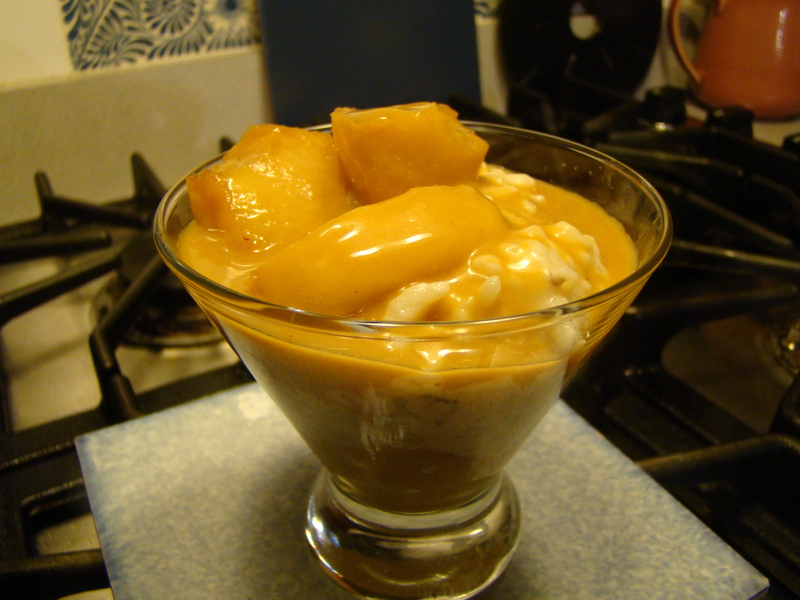 This week’s recipe for French Fridays with Dorie is Rice Pudding and Caramel Apples. The rice pudding recipe is different than my usual method, so I was interested to try. The caramel apples sounded amazing, independent of the pudding. Rather than leftover rice, Dorie’s recipe starts by boiling Arborio rice until it is partially cooked. Then, the rice is cooked in a quart of milk (I used 1% rather than whole) along with some sugar until the rice is tender and all the milk is almost, but not completely, absorbed. Simple, other than giving it the occasional stir and keeping an eye on the pot to be sure the milk doesn’t boil over. The one mystery of rice pudding is what to do with the skin that keeps developing on the top. Do you discard it or just keep stirring it in? Over the course of the half hour I cooked and stirred, I did both. The apples were relatively easy too. Have I mentioned that I’m afraid of molten sugar? Fortunately, until I looked at the sugar moistened with lemon juice bubbling in the skillet, I didn’t realize that was what I was doing. 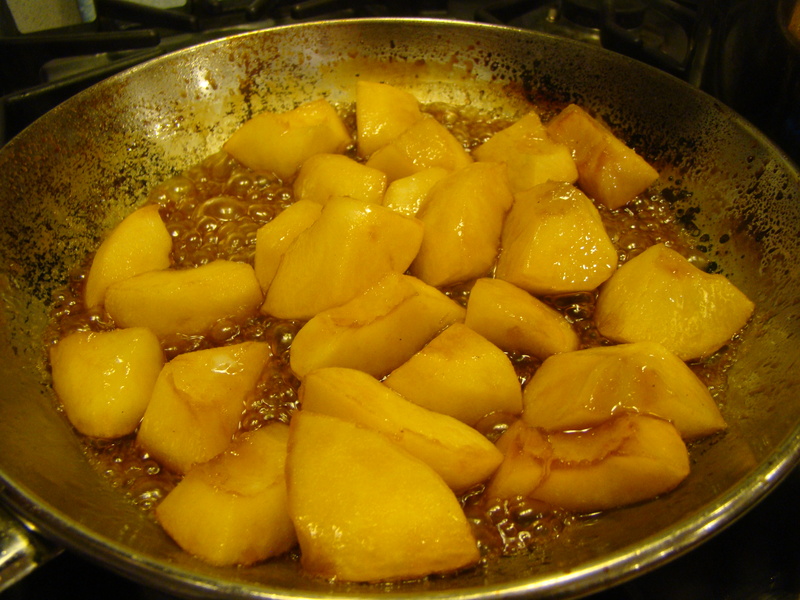 Once the sugar was melted, I stirred in apple juice and the apples and continued to let it boil away. Finally, heavy cream is added and the caramel gets boiled some more to mellow the sauce. Now the hardest part – waiting to taste it…The caramel apples were dangerously hot. The rice pudding was far above room temperature. An ice bath solved the problem for the rice pudding. I wanted the apples to be warmer so just let them sit on the counter. I had to wait about half an hour. As suggested, I layered apples, pudding and more apples, parfait-style in a glass. Definitely fancier than my usual rice pudding, but equally delicious. Honestly, I don’t know whether I’d make the rice pudding this way. I’d probably use my tried-and-true method. The caramel apples are the keeper part of this recipe. I’d definitely make them again. I am thinking up other ways to use them: topping yogurt, in a tart, in a turnover. The possibilities are endless. The other Doristas are making the same recipe this week. Check out their links here. Here’s the recipe from Epicurious. You can also find the recipe in Dorie Greenspan’s book Around My French Table..
Now for a word about the Doristas. Last weekend, I attended the International Food Bloggers Conference in Seattle. A primary motivator for signing up was the keynote speaker, none other than Dorie Greenspan, and the opportunity to meet about a dozen of my fellow French Friday bloggers. Cyberfriends are an odd duck. On the one hand, week after week, you read their personal stories on their blogs and converse through comments and occasional emails so you know them. On the other hand, they are strangers. When I was young, I had various pen pals, and though we wrote letters back and forth for months, I never actually met any of them in person. The anticipation of meeting the Doristas gave me a similar feeling, like I was going to meet my pen pals. Well, the actual meeting exceeded all expectations. When I arrived in the lobby of the hotel, I recognized a small group from their pictures on their blogs or from Facebook. They recognized me too. Hugs all around, and more hugs as more Doristas arrived. Over the course of the weekend, we bonded. Though we were sort of strangers at the beginning of the weekend, we all hand common interests and the more I got to know each person, I felt like the group was filled with people that would be my friends regardless of how we met. Everyone seemed to genuinely enjoy each other’s company. Aside from conference activities, we explored Seattle together for some early morning breakfasts, and on Sunday night, before we went our separate ways, we shared a final dinner together. By the end of the weekend, I felt like I was saying goodbye to my friends from summer camp. My heart swells to think of all the good feelings that flowed between us throughout the weekend. It was a unforgettable experience. For those of you other Doristas who couldn’t be in Seattle, we really missed you. Hopefully, we will arrange another gathering in the future so more of us can meet in person. Until then, Happy Friday! 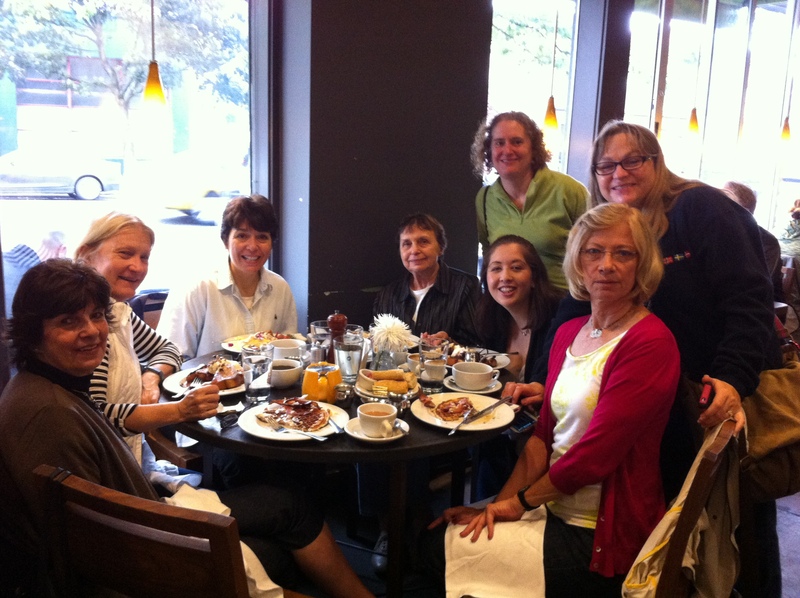 Posted on 27 September 2013, in French Fridays with Dorie, IFBC 2013 and tagged apples, desserts, French Fridays with Dorie, friendship, rice pudding. Bookmark the permalink. 26 Comments. I love rice pudding too – it reminds me of home. The apples – not so much. Glad you enjoyed the conference. I had the same with the skin. But it tasted real nice. So did the caramalized apples. It was a good recipe! Your camp analogy is perfect for how well we meshed and our bittersweet goodbye afterwards. I’m so happy I got to spend time with you all through the weekend. My mom always made rice pudding whenever we had leftover rice. Now that I’m an adult, there’s no such thing as leftover rice in my house. My husband will eat as much as I make. I swear to you, I’ve doubled rice recipes, hoping for leftovers, and he just keeps eating until it’s gone. I don’t know where he puts it. Oooh I could have been there to meet all of you. It is so nice to read all of your stories and look at all your photos. As for the rice pudding, I deemed it had way too many steps for my hectic week and decided to make something else. Plus I’ve never been a huge fan of rice pudding. But glad you enjoyed the recipe and the good memories it brought back. Sounds like you had a great time at the conference. I enjoyed looking at the pictures on FB. The apples were my favorite part of this recipe and like you, I am thinking of various ways to use them in other recipes. Have a great weekend. What a great sounding conference! Betsy, I enjoyed meeting you and like the way you write about the bonding experience. It was a joyful time:) I wasn’t a rice pudding fan but I am now! But I do agree with you about the apples, that’s the real keeper here! Did not have any skins cos I kept stirring for the 1st 15mins with a couple rest stops! Then I let my thermal cooker did the rest. Love the chunky apples on top of your pudding! I hope there will be an East Coast meeting of the Doristas… I’m happy that so many of you meet. Please, know that if you are ever in NYC I would love to meet and bring you to lunch. NY is easy for me to get to and I lived there for a long time. I’m impressed that you got to the pudding after all that traveling. Glad you enjoyed it. story of your Dad and the rice pudding. Have a great weekend. From the accounts I have read, everybody had a great time in Seattle. Maybe another time…. Your pudding looks just fine and the apples were delicious. I agree – friends no matter how we met! We really enjoyed meeting you! And promise to make it to Boston one day – I’ve wanted to go there ever since I studied the architecture in art history class in college. Your pudding looks great! This was my first time making rice pudding, so I don’t know any other method. I wish I could have joined you all at IFBC, but enjoyed seeing all the pictures as the weekend unfolded. Betsy, your rice pudding with the caramel apples looks so nice and creamy – truly comfort food at its best! But then as you already know, I am kind of biased when it comes to rice pudding! Hope life is treating you well this week! sorry, meant to say made the trip! Oh I just can’t wait to get more of the group together next time, how amazing is it going to be??? :) But Seattle was certainly unforgettable! I agree. The apples and caramel are definitely the keeper part of this recipe….It sounds like you all had an amazing time in Seattle. I do hope there will be another Doristas meet-up at some point in the future. I wish I’d been there with you all! It was so lovely to get the care package that you and Susan put together. I hope there’s another Dorista gathering someday, because it would be wonderful to meet you all.